Syed Balkhi here. 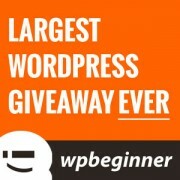 On July 4th, we celebrated our 4th birthday with the largest WordPress giveaway. We also did a fundraiser to raise $25,000 to build a school, and we were successful. I want to thank all of you guys for your continuous support that you have shown over the years. I also want to thank all of our sponsors who helped made this giveaway possible. We had 200+ prizes with a combined value over $25,000. I want to give a special shout out to the top sponsors: MaxCDN, StudioPress and the Copyblogger family, ManageWP family with SEO Smart Links and last but not least HitTail. iThemes and BackupBuddy, Sucuri, Bluehost, Themify, Elegant Themes, Headway, Soliloquy, Gravity Forms, Standard Theme, InMotion Hosting, Web Hosting Hub, Pippins Plugins, SeedProd, WPValet, WPZoom, Michael Hyatt, Page.ly, ZippyKid, Yoast, RaffleCompter, Themefuse, PixelKit, and Social Metrics Pro. Before I list the winners, I want you guys to check out our new free floating social bar plugin. It is my gift for the entire community. Extra thanks goes out to Thomas Griffin for helping with this plugin. Here is a tutorial and more interesting facts about the plugin: how to add the floating social bar. Ok now here is the list of winners. All winners should have received an email from us already. If you haven’t, and you see your name in the list, then please get in touch. Note: 2 names were removed because they were only emails and we didn’t want to reveal that in public. Congrats on reaching your goal and thanks for creating such a great resource for new wordpress users. Keep the great content coming! Thanks for the kind words Nadia. I wish I had signed up before. I would love to have one this!! It’s good to see my name in the list…after all it is a valuable reward for my loyal reading of this blog. got a theme license and waiting for further response. I completely forgot I entered until I saw the email stating I won. Thanks! I can see my name but I Haven’t received any email yet ! woohoo i am a winner…thanx syed i have always been a loyal reader of this blog and will continue to be…you guys never organize giveaways a lot, otherwise i would have participated in each one of them, hehe anyways great job and i had checked out your plugin right on the day it was released. you had another social sharing plugin at first i don’t remember its name lol…both of them are the best…this one is better than digg digg especially because you used the socialite js. keep rockin’ guys and kudos to all the winners and participants! Thanks Gautam. Yes, I did release Smart Sharing plugin long time ago, but it was very buggy. I pulled it off when I stopped using it on WPBeginner.